THE NATIONAL WEATHER SERVICE IN UPTON HAS ISSUED A WINTER STORM WATCH...WHICH IS IN EFFECT FROM TUESDAY EVENING THROUGH WEDNESDAY AFTERNOON. * ACCUMULATIONS...6 TO 12 INCHES...WITH LOCALLY HIGHER AMOUNTS POSSIBLE. * WINDS...GUSTS 25 TO 35 MPH. * VISIBILITIES...UNDER 1/4 MILE AT TIMES. 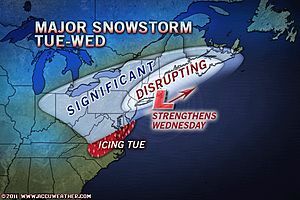 * TIMING...HEAVIEST SNOW OCCURS LATE TUESDAY NIGHT INTO EARLY WEDNESDAY. * IMPACTS...HAZARDOUS TRAVEL TUESDAY NIGHT AND THROUGH THE DAY WEDNESDAY. A WINTER STORM WATCH MEANS THERE IS A POTENTIAL FOR SIGNIFICANT SNOW...SLEET...OR ICE ACCUMULATIONS THAT MAY IMPACT TRAVEL. CONTINUE TO MONITOR THE LATEST FORECASTS.